Pop-up campers are maybe one of the most popular and mostly loved types of recreational vehicles. When it comes to buying one, it is always hard decision which one to choose as there are several different manufacturers, which produce high quality and reliable pop-ups. Amongst many, the most wanted are Coleman, Jayco, Starcraft, Palomino and many more. - Coleman is maybe North America's bestselling brand of pop-up campers from 1979. The company was founded in 1966 and ever since it has been present on the camping market. It's founder was William Coffin Coleman and at first the company was specialized in producing equipment for the camping and recreational vehicles. Nowadays it has been manufacturing high quality pop-up campers designed for people who enjoy the outdoors adventures. 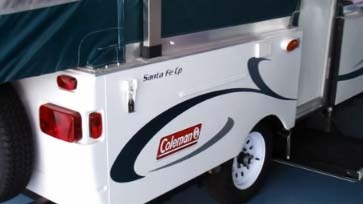 All pop-up campers produced by Coleman offer increased storage and are loaded with amenities and features that provide you the ultimate in camping comfort. - Jayco is another company specialized in outdoor vehicles. It was founded in 1968 by the late Lloyd J. Bontrager, a family man and inventor. At the beginning of his career, he made his own prototype camping trailer and unique system for fold-down campers, which is still in use. At the present, the company is trying to become the most respected brand in the camping industry. As far as pop-up campers are concerned, Jayco produces high quality, high value, and competitively priced campers. All Jayco pop-ups are comfortable, easy to set up, easy to use and simple to maintain. The company is very proud of their lightweight units, which give you the feeling of camping in the outdoors while still being protected from the elements. - Starcraft has been present in the recreational vehicles industry from 1903. It is considered as one of the oldest and the most respected names in camping business. They have been producing pop-up campers from 1964. Also they are the first who started producing pop-up campers with hard tops. Their pop-up campers are known for their durability and the highest quality materials they are being made of. People working in the company are paying extra attention to details, which made the name Starcraft the most recognized name when the camping world is concerned. - Palomino started constructing campers in 1968. Its founder was Vern Landey who was at first a tent trailer dealer and after several years he started the production of quality campers that were light weight and of very affordable prices. Their dedication to work and excellent craftsmanship together with the lovely design is what makes the pop-up campers made by Palomino very popular amongst many campers. At Palomino, they are constantly trying very hard to create pop-ups that will satisfy the customers. Their pop-up campers are filled with everything you need providing you the comfort of the home. - Livin Lite is among leading manufacturers of lightweight pop-up campers made of aluminum. They are producing pop-up campers for the families who like experiencing the camping lifestyle. Pop-ups made by Livin Lite are made to last long. Being made of aluminum, the Livin Lite pop-up campers are ideal for most sedans and nearly every van. The Livin Lite workers worked hardly to create pop-up campers which are very simple to maintain, are easy to tow as they are light weight, and what is more interesting they are quality constructed. Equipped with all modern amenities, pop-up campers made by Livin Lite became very popular and mostly wanted among camping fans. There are many pop up camper manufacturers that have quality tent pop up trailers and truck pop up trailers. There is Lance Camper, Alpenlite truck campers, Bigfoot Industries and Fleetwood truck campers. This is just a couple of them; there are so many manufacturers in the world that I can’t even think of all of them. Apache, Jayco, Starcraft, Palomino, Viking, Coleman and Rockwood are very popular names in the pop up camper manufacturer’s world. They have a fine reputation as being very well constructed tent pop up trailers as well as truck pop up trailers. They know what the customer wants and builds high quality campers for your pleasure and enjoyment. 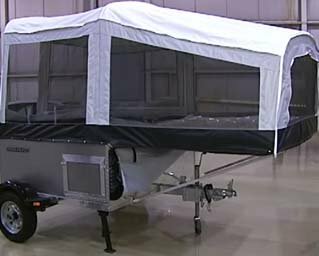 If you are looking for a pop up camper manufacturers that have accessories such as ac for pop up camper and popup camper screen rooms, these are the ones to look at. They come with most campers and if not can be added for a small price. You will want to also check out the other accessories that these pop up camper manufactures have to offer. Waterproof pop up tent areas are very important also. These companies make sure that all there canvas tops and screen rooms are waterproof and ready to use in any weather conditions. You may want to check out the warranties as well. The pop up camper manufactures have different warranty plans available at the time of purchase. This is always something to look at when buying a pop up camper from any manufacture. All pop up camper manufacturers are very unique in offering different styles and lengths. The most popular is the campers that come with accessories already included. Even if you find a manufacturer that you are comfortable with, they may not have every thing you want. That is where looking at used campers can be more accommodating. Used campers can be just as elegant and freshly decorated as the new ones. When you find a camper you really want, it may be a used tent pop up trailer. Pop up camper manufacturers realize this and are continuity updating the newer models to try and keep a hold on the market. This doesn’t mean the upgrades are suitable for everyone. Michigan camping is different camping in Maryland; this is why all campers are customized by the owners to fit the climate. Ac for pop up camper is needed in Maryland but not so much in Michigan. So browsing around the different states might help you find the accessories all in one camper. Massachusetts on the other hand might have other accessories and might be more affordable. The interior and exterior are very important points to look at. The overall construction is also very important when looking at pop up camper manufacturers. You want to be assured the entire construction is made to last. This also means the canvas and screens. Also check the storage space to make sure there is enough room for everything you need when you’re out camping. There are so many things to look for in a camper that will find your self overwhelmed at the many styles and accessories to consider. Pop up camper manufacturers are located in many populated areas and can give you good deals on the campers along with the right accessories. You may need to search around and find out all the information available before choosing what type of camper you really need. The end result is a fun and enjoyable camping trip no matter where you are. So get ready to gear up and pop up for the great outdoor adventure of your life.